Recently, the US National Oceanic and Atmospheric Administration (NOAA) has assisted NPS to map and extract detailed information about the monument's seafloor habitats. To do this efficiently, NOAA needed to develop a new semiautomated approach that would allow it to process, analyze, and fuse different types of imagery and provide NPS with the fundamental data needed to make informed decisions. 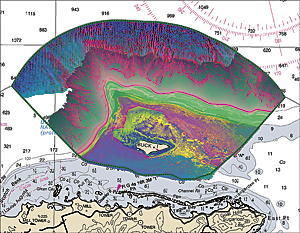 After evaluating the area, NOAA determined that traditional marine mapping methods that rely on the manual interpretation of optical imagery derived from satellites couldn't produce a comprehensive habitat map of the monument given its depths, which extend from the coastline of Buck Island to 1,800 meters at its deepest extent. "We had a very unique problem," says Tim Battista, an oceanographer at NOAA. "There is no one technology or sensor that allowed us to collect the data we needed in the range of depths present at the monument. We had to devise a method that would allow us to both measure seafloor depths, as well as characterize its habitats, across the entire seascape in the monument." 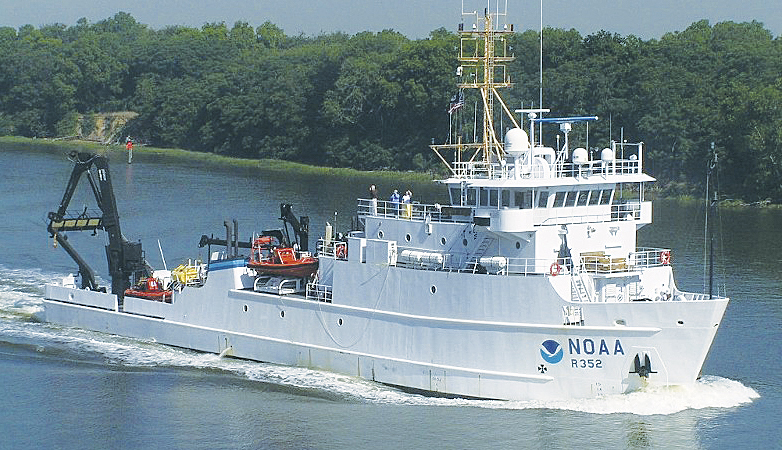 After much testing and innovation, NOAA ultimately devised a new method that fuses four different sonar, lidar, and optical imagery sensors to gather the information needed. NOAA chose to use Esri's ArcGIS with ENVI image analysis software from Esri Platinum Partner Exelis Visual Information Solutions of Boulder, Colorado, to tackle this unique challenge. This combination allows the processing and image analysis of the latest image types, such as radar, lidar, optical, hyperspectral, stereo, thermal, and acoustic. 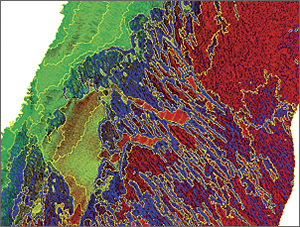 Using GIS and image analysis software, the strengths of these different sensors can be exploited together, which creates a rich context that aids in decision making. Using an automated workflow, NOAA staff segmented the imagery data using the software's extraction tool. Following image segmentation, users classified and assigned attributes to the features in their imagery. NOAA staff classified features by selecting locations with unique acoustic or optical signatures and performed ground validation using still and video cameras operated by divers and remotely operated vehicles. NOAA's classification scheme used to describe these sites takes into consideration what the seafloor is made out of, what is growing on top of it, and the quantity of cover. NOAA then took the segments and classified ground validation points using a free add-on tool to ENVI called RuleGen. RuleGen includes a classification and regression tree that was well suited for NOAA's acoustic datasets. Afterward, NOAA staff returned to the field and verified the accuracy of the output—a draft classified habitat map. "Acoustic data is often very noisy and heterogeneous, which makes classification difficult using traditional pixel-based approaches," says Sam Tormey, marine spatial analyst contracted with NOAA through scientific support provider CSS-Dynamac of Fairfax, Virginia. "We were able to overcome these challenges, so we are no longer classifying a pixel but, rather, an object. We are now able to more objectively and efficiently deal with heterogeneity and make products that meet our partners' needs." Previously, NOAA staff could only monitor limited areas because the process was very time intensive and depended on the experiences and interpretation skills of the analyst, which aren't highly replicable. "Our past mapping efforts were conducted by manually digitizing and interpreting optical imagery," says Tormey. "The new methods that were developed allow us to integrate the strengths of multiple acoustic sensors and multispectral and lidar imagery and produce a seamless product across the entire extent of our study areas."